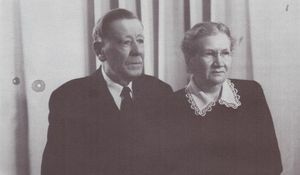 Aeltester Johann P. & Katharina Klassen. Johann Peter Klassen: a leading elder and writer of the Russian and Canadian Mennonites; born 27 May 1868 (O.S. 15 May) in Neu-Schönwiese near Alexandrovsk (Zaporizhia), South Russia, the third of four children of Elder Peter Abram Klassen (22 October 1825 - 13 February 1905) and Aganetha (Schultz) Klassen (1 April 1832 - 7 December 1920); his father had four children from his first marriage to Anna Janzen (1828-1863). Johann was married first to Katharina Wieler (26 February 1870, Nikolaifeld, Yazykovo, South Russia - 31 August 1909, Neu Schönwiese, Chortitza Settlement, South Russia) on 27 September 1891 in Franzfeld, Yazykovo, South Russia. She was the daughter of Abraham Wieler (23 January 1841 - 31 January 1907) and Helena (Lepp) Wieler (14 January 1848 - 29 May 1911). Johann and Katharina had eight children: Peter, Helena, Aganeta, Abram, Johann, Käthe, Heinrich, and Kornelius. After Katharina's death, Johann married for the second time on 8 May 1911 in Chortitza, Chortitza Settlement to Katharina Dyck (26 April 1881, Rosenthal, Chortitza, South Russia - 21 December 1954, Winnipeg, Manitoba). Johann and his second wife Katharina had two sons, Victor and Eduard. Johann died in Vancouver, British Columbia on 25 May 1947 and is buried in the Brookside Cemetery in Winnipeg, Manitoba. Johann's childhood and early school years were spent in Neu-Schönwiese before attending the Chortitza Zentralschule and Teachers' College. He served as the Neu-Kronsweide village schoolteacher for five years. He served the Kronsweide Mennonite congregation as a minister from 1904 and as elder from 1907 until his immigration to Canada in 1923. At the request of the church, Klassen moved his home from Neu-Schönwiese to Alt-Schönwiese so that he could be more centrally located. The years during the Russian Revolution were difficult for him. Murders, typhus, cholera, and famine all plagued the Schönwiese area, and the village was occupied at various times by both Machno bandits and Red Army troops. In 1923 Johann and his family immigrated to Canada, eventually settling in Starbuck, Manitoba. In 1928 he founded the Schoenwiese Church in Starbuck, and when he moved to Winnipeg in 1929, the main center of the Schoenwiese Church was established there at the First Mennonite congregation. Johann served as its elder until his retirement in 1939. Klassen suffered from eczema in his later years and was advised to relocate to Vancouver, where he passed away in 1947. Klassen was a rather prolific writer, chiefly of poems. J. H. Janzen calls him "the most productive and most natural of [the Russo-Canadian Mennonite] poets." He adds, "he writes mostly for existing melodies, so his poems at the moment they appear are already songs .... An inexhaustible and unconquerable joy speaks out of all his poems..., even though he has suffered much from an infirmity." His published booklets of poems include Aehrenlese (Winnipeg, n.d., 73 p.), Brocken (Winnipeg, 1932, 32 p.), Dunkle Tage (Scottdale, 1924? 32 p.), Krümlein (Scottdale, 1924? 43 p.), Meine Garbe (Vancouver, n.d., 102 p.), Nohoaksel (Yarrow, 1946, 87 p.), Roggenbrot (Vancouver, 1946, 134 p.), Wegeblumen (Scottdale, 1924? 52 p.), Der Zwillingsbruder von "Meine Garbe" (Vancouver, n.d., 100 p.). In addition he also published Reiseskizzen über die Auswanderung im Jahre 1923 (Scottdale, 1924? 37 p.). GRANDMA (The Genealogical Registry and Database of Mennonite Ancestry) Database, 6.02 ed. Fresno, CA: California Mennonite Historical Society, 2010: #162784. Janzen, Jacob H. "The Literature of the Russo-Canadian Mennonites." Mennonite Life 1 (January 1946): 23 f.
Klassen, Is. P. The Kronweide Mennonite Church in Russia: Its Villages and Elders. Translated by Edward Enns. Winnipeg, MB: Mennonite Heritage Centre, 1993. Rempel, J. G. Fünfzig Jahre Konferenzbestrebungen 1902-1952. [Winnipeg?] : Konferenz der Mennoniten in Canada, : I, 183 f.
Bender, Harold S. and Richard D. Thiessen. "Klassen, Johann Peter (1868-1947)." Global Anabaptist Mennonite Encyclopedia Online. April 2010. Web. 23 Apr 2019. http://gameo.org/index.php?title=Klassen,_Johann_Peter_(1868-1947)&oldid=136052. Bender, Harold S. and Richard D. Thiessen. (April 2010). Klassen, Johann Peter (1868-1947). Global Anabaptist Mennonite Encyclopedia Online. Retrieved 23 April 2019, from http://gameo.org/index.php?title=Klassen,_Johann_Peter_(1868-1947)&oldid=136052. Adapted by permission of Herald Press, Harrisonburg, Virginia, from Mennonite Encyclopedia, Vol. 3, p. 192. All rights reserved. This page was last modified on 24 September 2016, at 19:02.